The revolutionary R.A.P.T. series training collars provides a versatile design for any situation. 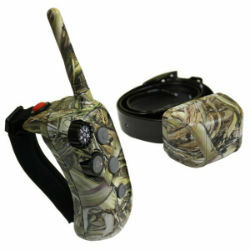 Features a curved transmitter design with a strap for multiple grip positions. The Rapid Access button provides quick corrections. This system can expand to a 2-dog or 3-dog system. The newly designed small, lightweight collar unit fits in the palm of your hand. The collar is waterproof, rechargeable, and fits small to large dogs. The transmitter FLOATS on water. Collar and transmitter outfitted in Waterfowl camo.